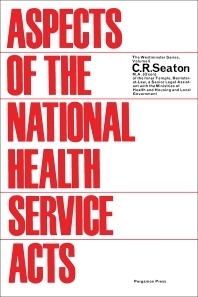 The Westminster Series, Volume 6: Aspects of the National Health Service Acts describes the intricacies of the creation of the National Health Service Acts within the context of the general plan while considering the main subordinate instruments that prescribe the details of the scheme. This book is divided into seven chapters and begins with an introduction to the objective of the Acts, subordinate rules and regulations, parliamentary influence, and finance. The succeeding chapters discuss the function, services offered, and the legal aspects of the Acts. These topics are followed by an examination of the local health authority services, their leadership, as well as the regulations concerning superannuation and transfer of officers. The final chapter considers the beneficial effects of the Acts. This book will be of value to health service students and workers, as well as the general public who wish to study the statutory basis of the Health Service.